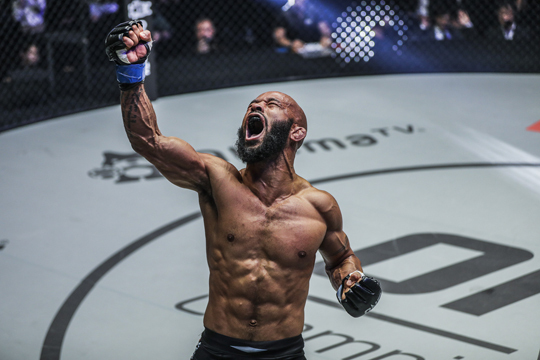 Tokyo ---Twelve-time Flyweight Mixed Martial Arts World Champion Demetrious “Mighty Mouse” Johnson of the United States made a successful ONE Championship debut as he submitted Yuya “Little Piranha” Wakamatsu of Japan in a ONE Flyweight World Grand Prix quarter-final contest at the iconic Ryogoku Kokugikan in Tokyo. Although Wakamatsu would land a few clean punches to keep Johnson on his toes, the American showcased his impeccable grappling skills to transition from one position to the next with relative ease. After grabbing a hold of Wakamatsu’s neck in the second round, Johnson secured a deep guillotine choke to force the tap. Russia’s Timofey Nastyukhin welcomed Eddie “The Underground King” Alvarez of the United States to ONE Championship, finishing the former 4-time Lightweight Mixed Martial Arts World Champion inside of the first round of a ONE Lightweight World Grand Prix quarter-final bout. After a few brief exchanges at range, Nastyukhin closed the distance and hurt Alvarez with a left straight, sending him reeling towards the cage fence. Nastyukhin then unloaded a barrage of punches as Alvarez covered up before the referee called a halt to the contest.